I had a fun weekend of watching basketball including seeing a future Bama player and a past one, but first let's deal with the current team. Our guys rolled into the P-Mac Center in Baton Rouge and battled for an impressive 15 point road win, to improve to 3-1 in conference play. For the first 30 minutes or so it looked like an ugly game between two mediocre at best teams. LSU maintained a 4 or 5 point lead throughout much of the game, but we made runs to briefly re-take the lead before giving it back. Even when things weren't going well, I thought our guys wanted this game more. We seemed to beat them to all of the 50/50 balls. I was a bit concerned about this matchup. In recent games where we've enjoyed moderate success; we've generally dominated the glass. 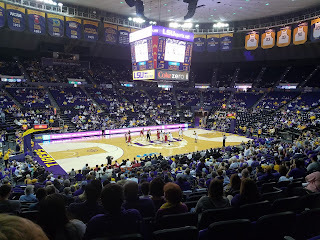 LSU has some bigs that look like they should be suiting up for Coach Orgeron next door at the football stadium, but credit to our guys for still narrowly winning the rebounding battle. LSU stubbornly stuck to a zone defense, and Riley Norris and Corban Collins absolutely torched them. Riley had a knack for finding the soft spot in their zone, in addition to going 3 of 7 from 3 point land for 20 points. Corban was on fire, making 7 from downtown and putting up 24 points. Donta Hall bounced back after a bad first half and playing in foul trouble to end up with 13. His timing on the rebound/dunk put backs is impeccable right now, and a couple of those seemed to really demoralize the Tigers. I would have preferred to see a little more dribble-drive from guys like Dazon and Braxton earlier in the game, but we got the shots to fall when we needed them to. Braxton, Dazon, and Jimmie played much of the second half with 4 fouls before Key finally fouled out. I was surprised LSU didn't make much more of an effort to get them out of the game. They seemed content to settle for long jump shots on offense and we did a good job of limiting their second chance opportunities. It was a tie game with 5 minutes to go, but Bama made some 3s and went on an 11-0 run that effectively decided the game. This time, instead of letting them back in the game, the team took care of the basketball and put it away, cruising to an easy 15 point win. We still only shot 65% from the free throw line, the inconsistency at the stripe makes me want to bang my head against a wall. LSU is a hot mess right now. That team is too talented to be playing this poorly, and I don't see any way Johnny Jones is still coaching there next year. There wasn't much of a crowd there for a beautiful Saturday afternoon game. I guess most of the Cajuns were outdoors hunting shrimp and crawfish or something. 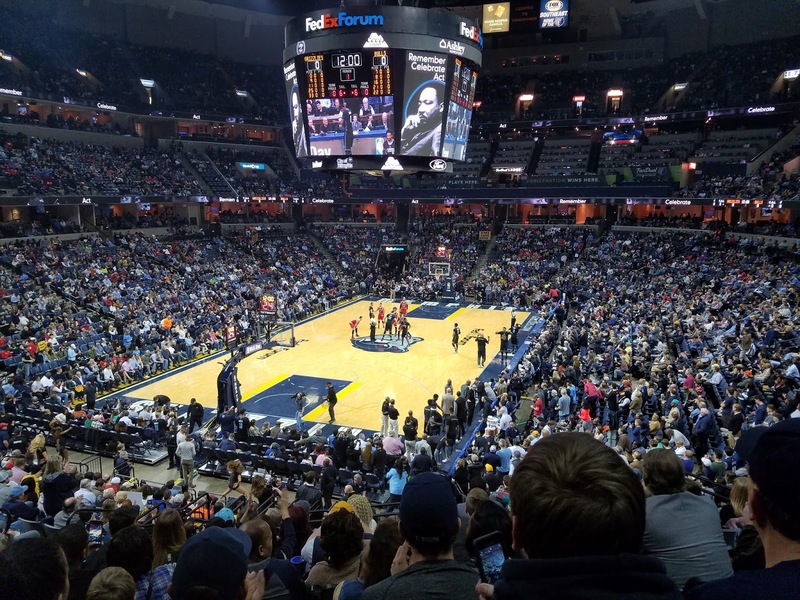 I estimate no more than about 5,500 or so fans were there, with a respectable showing of 300 or so Bama fans scattered throughout, including one section behind a basket that was heavily populated with Crimson Clad spectators. We were even able to get the "Roll Tide" chant going at the end of the game. I know LSU fans have a bit of a reputation, but I've always found them to be fun and hospitable, and it was no different this weekend. 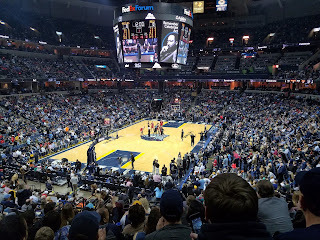 The atmosphere was remarkably quiet for most of the game, it was probably the most subdued I've heard the Tiger faithful at any game. 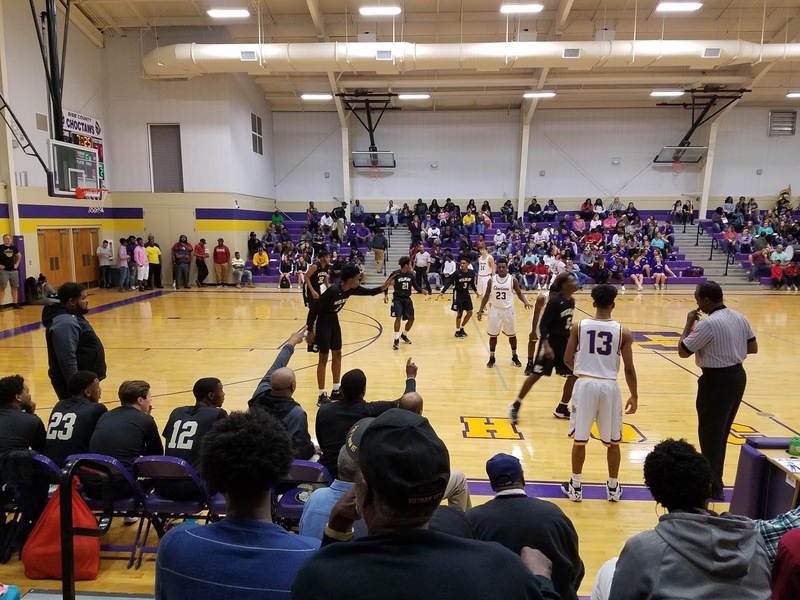 I was in Centreville, AL last Friday night and got to watch a bit of the Hale County v. Bibb County basketball game featuring Bama signee Herb Jones. I only stayed for the first half, and the level of competition was not great so it's hard to draw too many conclusions. He did make his first 3 or 4 three pointers before cooling off later in the half. He has a silky smooth shot, and is long, quick, and athletic. At times he's almost too unselfish, he did have a couple of turnovers trying to get the ball to his teammates when he probably could have easily scored of his defender himself. He runs the floor well and played good defense. His demeanor appears to be a quiet "lead by example" type. I could see him being a Braxton Key type, although I could see him getting pushed around a bit by the bigger 3s and 4 types in the post. He has great form and I think he was something like 4 of 5 from the free throw line. Up next, we stay on a Tiger meat diet as Mizzou comes to Tuscaloosa for a 6pm tipoff Wednesday night. Mizzou is a bad team, but they will beat somebody in the conference, and we aren't good enough to take a night off, so we'll need to bring our A-game and avoid the dreaded "bad home loss." The game will be televised on ESPNU. Did you know you can create short links with AdFly and get cash for every click on your short links.